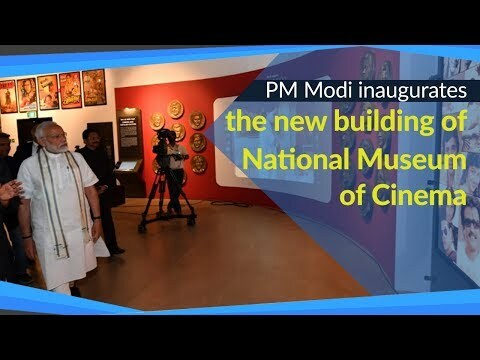 Prime Minister Narendra Modi inaugurated the National Museum of Indian Cinema (NMIC) in Mumbai on 19 January. The state-of-the-art Museum, built at a cost of Rs. 140.61 crore, aims to take its visitors through an absorbing journey of over a century of Indian cinema in a story-telling mode with the help of visuals, graphics, artefacts, interactive exhibits and multimedia expositions. * Gandhi & Cinema: it not only depicts the movies made on the life Mahatma Gandhi but also showcases the deep impact his life had on cinema. * Children’s Film Studio: it gives visitors, particularly children, an opportunity to explore the science, technology and art behind filmmaking. It offers hands-on experience on various facets associated with making cinema like camera, light, shooting, the experience of acting, etc. – presented in an interactive format. The exhibits displayed include chroma studio, immersive experience zone, stop-motion animation studio, virtual makeover studio, etc. * Technology, creativity & Indian cinema: it showcases the creative use of technology by Indian filmmakers over the years to produce a cinematographic impact on the silver screen. * Cinema across India: it showcases the charismatic kaleidoscopic presence of the vibrant cinematographic culture across India. Gulshan Mahal is an ASI Grade-II Heritage Structure which has been restored as part of the NMIC project. The displays showcase the journey of over a hundred years of Indian cinema. It is divided into 9 sections viz. The Origin of Cinema, Cinema comes to India, Indian Silent Film, Advent of Sound, The Studio Era, The impact of World War II, Creative Resonance, New Wave and Beyond and Regional Cinema.